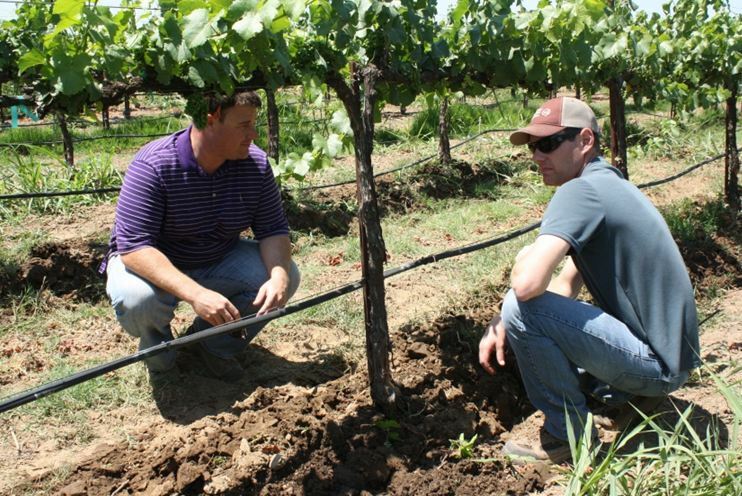 How Do Growers Sharpen Their Knowledge About Vineyard Management? Farming winegrapes is a knowledge intensive activity. Growers learn about vineyard management by accessing a wide variety of information resources, many of which come in the form of outreach programs provided by organizations like the Lodi Winegrape Commission (LWC) and University of California Cooperative Extension (UCCE). Effective grower outreach can help growers sharpen their knowledge about vineyard management and ultimately have a positive impact on the viability of their farming operations. This research focuses on two questions, both of which have application in developing innovative outreach programs. First, we were interested in knowing which information resources are most useful to growers for learning about vineyard management. Second, we took a novel approach and analyzed the knowledge sharing network of growers and outreach professionals to identify the types of individuals are most central in this network. 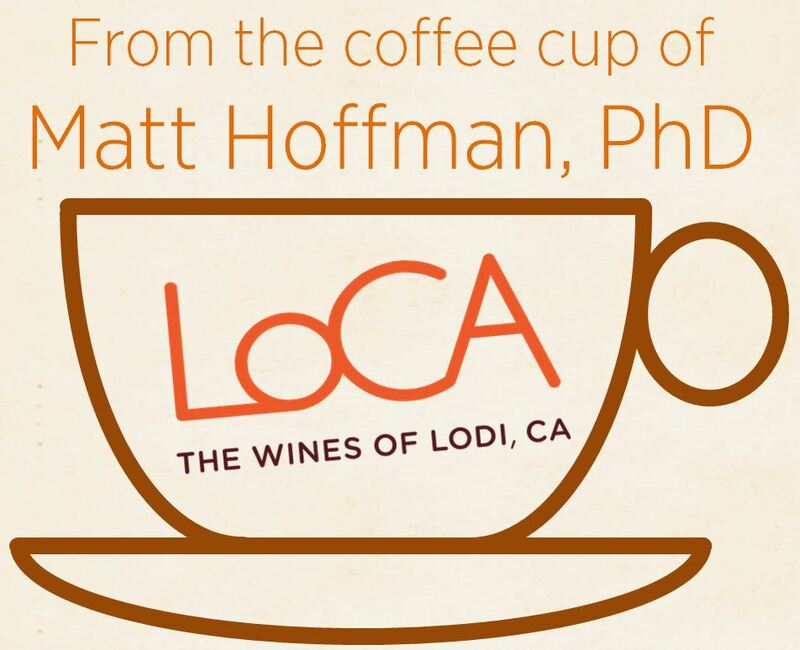 The results from this study have been considered in the development and implementation of the Lodi Winegape Commission’s grower outreach programming. This Coffee Shop article was originally published in 2011 by Matthew Hoffman, Mark Lubell, and Vicken Hillis from the UC Davis Center for Environmental Policy and Behavior. The original article can be accessed HERE. This research was funded by a grant from the National Science Foundation. Experiential and social learning were found to be highly useful pathways for grower learning. Pictured here are Lodi winegrape growers engaging in both experiential and social learning simultaneously. They are sharing thoughts after observing a trial pass of a prototype multi-row in-row cultivator. We found field research and trials conducted in growers own fields and in others’ fields (experiential) and interpersonal relationships with other growers (social) were ranked as highly useful sources for learning about vineyard management. Different learning pathways can work synergistically, and in this case experiential and social learning complemented each other. Personal experience with vineyard management and personal relationships among growers and outreach professionals are the most useful information resources for Lodi winegrape growers. Growers who also work as outreach professionals (e.g. vineyard managers or Pest Control Advisers (PCA)) are more central in the knowledge sharing network than those who are only growers or only outreach professionals. They are thus among the best positioned to access and spread information about vineyard management. In Lodi, the UCCE County Farm Advisor is the most connected individual in the knowledge sharing network, reflecting the continuing importance of traditional outreach and education programs. While agricultural outreach programs commonly focus on sharing technical and scientific content in written documents or oral presentations, our research highlights the importance of informal social relationships for grower learning about vineyard management. We found that grower knowledge is heavily rooted in their personal experiences and that their knowledge is then shared through the grower community through their interpersonal social network. The highly central position of the UCCE County Farm Advisor in the knowledge sharing network suggests that formal and traditional programs provide a lasting basis for grower outreach. However, the importance of growers who are also outreach professionals suggests that more decentralized outreach approaches that operate outside of the UCCE system are also important. We suggest that local outreach programs like the LWC capitalize on the social nature of the knowledge system by actively cultivating knowledge sharing among growers and outreach professionals, rather than merely acting as broadcasters of information. Figure 1 – Average percentage of growers ranking information resource categories as “very useful”. Reported in Figure 1 is the average percentage of growers’ ranking of information sources as “very useful” within four categories: Personal experience, personal relationships, organizations, and published materials. A majority of growers (58%) reported personal experience as their most useful information resource; second were personal relationships (51%). Learning about vineyard management is driven by grower engagement in the “hands on” practice of winegrape growing itself and by participating in a knowledge network with other growers and outreach professionals. 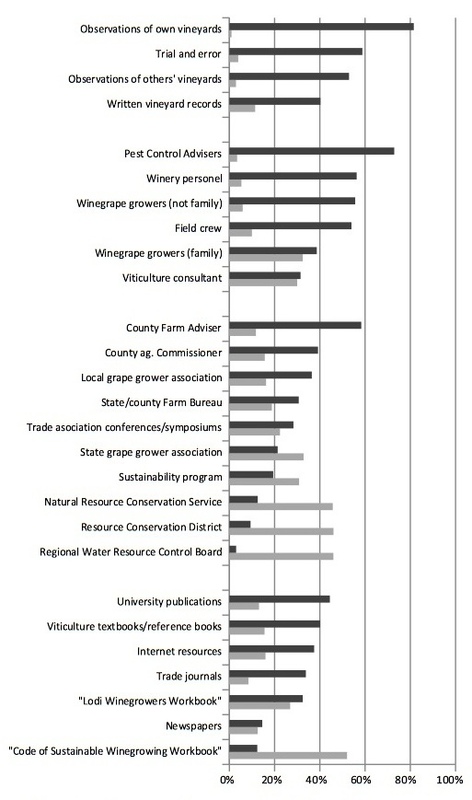 To provide a more detailed breakdown within each category, Figure 2 reports the percent of growers who reported each individual information resource as being “very useful” and as being “never used.” The top ten ranked “very useful” information resources include observations of growers own vineyards (82% of growers), PCAs (73%), trial and error experiences in ones own vineyard (59%), County Farm Adviser (58%), winery representatives (56%), other winegrape growers who are not family members (56%), the growers field crew (54%), observations from other growers vineyards (53%), university publications (44%), and written vineyard management records (40%). From among this ten, only university publications fall outside the category of personal experience and personal relationships. There is also a clear negative relationship between “very useful” and “never used,” which suggests growers tend to return to information sources they find initially useful and abandon those found not useful. Figure 2 – Percent of growers rating information resources as “very useful” (dark grey) and as being “never used” (light grey). A growers’ position in the social network can affect his or her ability to access and spread viticultural information. Individuals who are most “central” in the network have the greatest potential to be aware of others opinions and insights about viticultural management because they are in communication with many others. They may also be able to rapidly spread information through the entire network because they are connected to others who themselves are connected to many others. We calculated each individuals centrality in the network, thereby quantifying their potential to access and spread information. Figure 3 visualizes Lodi’s knowledge network, where points represent individuals and lines represent communication and knowledge sharing. Figure 3 – Conceptualization of Lodi’s social network of knowledge sharing. Aqua: CE farm adviser, Orange: grower + outreach, Purple: outreach, Grey: grower. Individuals who have higher centrality scores are physically located closer to the center of the network diagram. Visual inspection of the network diagram yields insight into which individuals and groups are most central or potentially best positioned to access and spread viticultural information. The County Farm Adviser (aqua) is very centrally positioned. 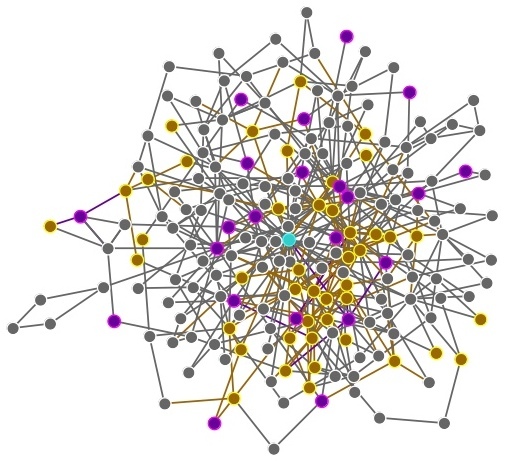 Individuals who are both growers and outreach professionals (orange) strongly tend toward the center so we see a higher density of these individuals in the middle of the network. Those who are exclusively outreach professionals (purple) also tend inward but to a noticeably lesser degree. In contrast, individuals who are exclusively growers (grey) are concentrated just outside the networks center and also make up the majority of the peripheral individuals. Figure 4 compares the average centrality scores of the three categories of individuals, and shows that growers and outreach professionals score higher than those who are exclusively growers or exclusively outreach professionals. Figure 4 – Average centrality scores of the three categories of individuals. These individuals are unique in that they not only communicate across bound- aries between outreach professionals and growers but also work in both. Their professional experience as viticultural “experts” and their practical experience as growers means that they might be the richest resources of viticultural knowledge. This characteristic, in combination with their high degree of connectedness to the rest of the network means that they are well positioned to spread their knowledge. Figure 5 shows average centrality scores by outreach category. Among those who are both growers and outreach professionals we found that the County Farm Advisor is by far the most central individual. This suggests that the Farm Adviser is positioned to have a good awareness of growers information needs and has the ability to rapidly spread information through the entire social network. While this finding is not surprising considering that County Farm Advisors have traditionally served a very important role in agricultural outreach and education, it is a reminder that the UCCE system continues to be a powerful actor in the agricultural knowledge system. Figure 5 – Average centrality scores by outreach category. The data comes from a mail survey of winegrape growers in Lodi, California. The survey was sent to all growers listed by the 2009 Pesticide Use Report provided by the San Joaquin County Agricultural Commissioner Office. The survey collected a total of 210 responses with an overall response rate of 49.42%. We measured whether 29 different information resources were used, and for those that were used we mea- sured their perceived degree of usefulness. The response options for each information resource were “never used”, “not useful”, “somewhat useful”, and “very useful.” Network information was collected by asking respondents to list the names of up to four other growers and four outreach professionals with whom they communicated and shared knowledge about viticultural management during the past year. Outreach professionals were categorized by job type based on information provided by survey respondents cross referenced with Internet searches.